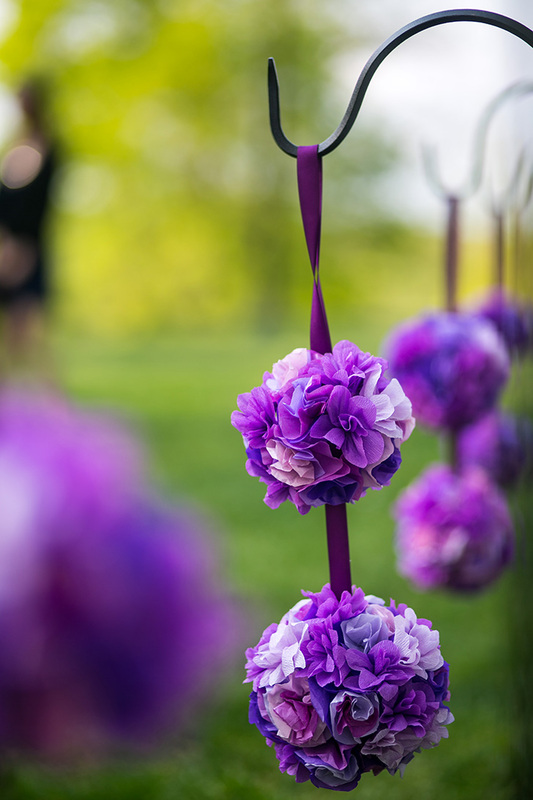 Several people have asked me where we got our wedding pomanders. My fabulous friends and I made them! I even roped my husband-to-be into helping. 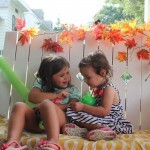 This project probably required the most labor out of all my diy wedding projects. We finished 24 pomanders over the span of about 2 weeks — there’s only so much tissue paper and glue-gunning a human being can take. 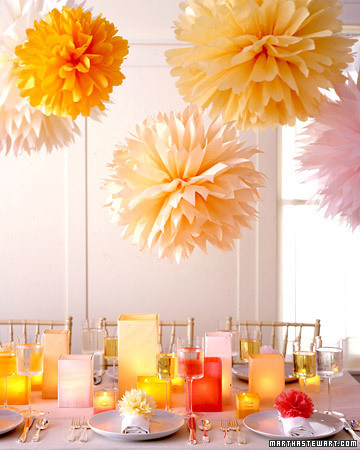 A google search for “how to make tissue paper pomanders” will garner you plenty of hits, so I’ll just give some guidelines and suggested links. Also note that I made two-tier pomanders, so some of the notes (e.g., supply quantities) are specific to my version. Keep the flowers of consistent height, or else your pomander will look “bumpy” and irregular instead of round. The flowers can really be anything — you could also buy silk flowers (like these, for example) or punch them out of paper, etc. Hot glue will melt the styrofoam, so use it sparingly. Also, be patient with holding things in position until the glue cools and your arrangement is set. Whatever you’re attaching, it’s probably a good idea to secure it with hot glue. Wrap the balls with crepe, securing with hot glue. This will help camouflage any gaps between flowers, so that you don’t have white or green styrofoam peeking through. Attach the ribbon loop (from which the pomander will hang). I used about 18-24″ of ribbon and pinned both ends to a small (2″) ball. Since I was making two-tier pomanders, I also cut about 10″ of ribbon and pinned one end to the small ball opposite the loop, the other end to a large (3″) ball. Gently gather the edges together to form a cone. Layer 3 “flowers” of different colors together to form 1 flower. Glue the layers together at the nested pointy base. They advise using crepe paper, but I used crepe streamer. I also avoided floral wire altogether. Cut a 10″ length of streamer and fold over multiple times along the width. On one edge, round one corner to make broad petals, or round both corners to make narrow petals. Starting at one end of the strip, roll the strip and arrange the petals to form the rose. Pinch the base as you roll to hold the petals in place. Staple the base to secure the flower. 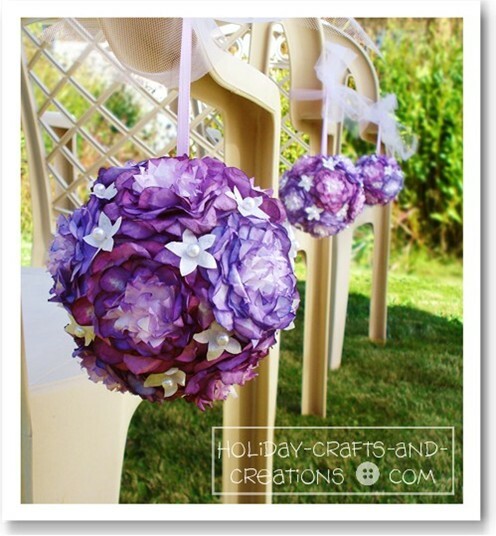 As you can see, I very much simplified both tutorials to make small, quick flowers for my pomanders. I tried using floral wire at first, but it was time-consuming so I adapted with a stapler and glue gun instead. 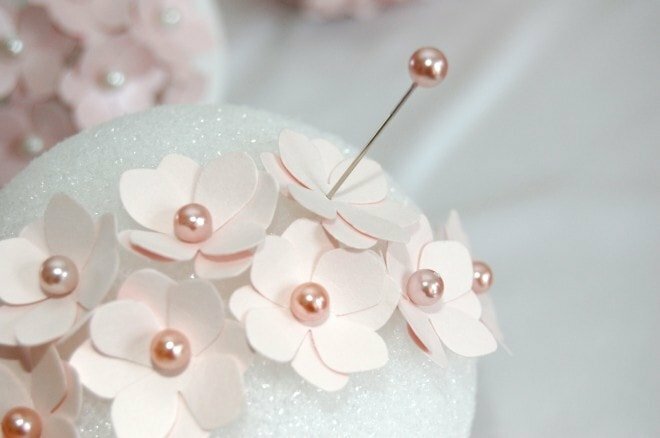 That said, I love the additional embellishments the tutorials suggest (coloring the edges for the carnations, adding seed beads to the center of the roses). Attaching the flowers: We hot-glued the flowers to the styrofoam balls about 1″ apart. We spaced them apart uniformly at first, totaling about 20-25 flowers. Then we went back and filled in gaps to make the pomanders look fuller and nicer. Altogether, the 2″ pomander probably had about 35-40 flowers while the 3″ size required 40-50. These are also lovely and would be fun to try! 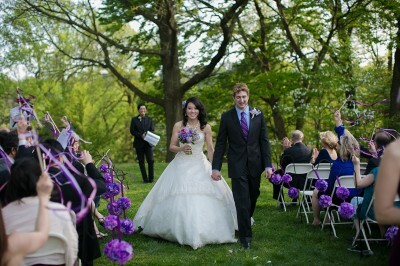 This entry was posted in Simple Pleasures and tagged wedding by anh. Bookmark the permalink. thank you for the ideas of the pomanders i created heaps of them for my brother’s wedding! where did you buy the pins to hang them on if you put them in the grass? Hi, we bought them at Lowe’s, I think — they are called shepherd’s hooks, available in the gardening dept.